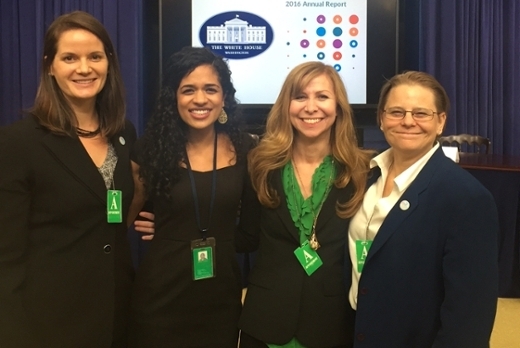 Kimberly Ross, GA Department of Public Health, Maya Shankar, White House Representative, Arianne Weldon, Get Georgia Reading director, and Jennifer Staple-Wax, Emory and Marcus Autism Center, participate in the unveiling of the Talk With Me Baby National Toolkit at the White House. The Talk With Me Baby (TWMB) initiative launched a new national toolkit on Sept. 15 at the invitation-only White House Summit on Behavioral Science Insights. TWMB was formed through a collaborative partnership among the Marcus Autism Center at Children’s Healthcare of Atlanta, Emory University’s Nell Hodgson Woodruff School of Nursing, Emory University School of Medicine, Atlanta Speech School, the Get Georgia Reading Campaign, the Georgia Department of Public Health, and the Georgia Department of Education. Lead researchers Jennifer Stapel-Wax, PsyD, associate professor at Emory University School of Medicine and Arianne Weldon, MPH, director of the Get Georgia Reading Campaign, managed the development of the toolkit at the request of the White House Office of Science and Technology Policy. The toolkit will serve as a model for other states aiming to adopt the TWMB approach and integrate Language Nutrition coaching as a competency among workforces already reaching new parents and babies—such as nurses, WIC staff, foster parents and other child welfare stakeholders, and more. A new partnership with the Barbara Bush Foundation for Family Literacy will allow for the expansion of TWMB training and resources—which thus far have been deployed only in Georgia—nationwide. The team has created a new online toolkit including a training curriculum, videos and other relevant resources to equip nurses and other healthcare providers to serve as Language Nutrition coaches. The toolkit also includes a new TWMB Scholastic Book that encourages new parents to read to and talk with their babies. "We are grateful to the White House, the Barbara Bush Foundation and all of our partners for the opportunity to extend our reach throughout other states," says Stapel-Wax, who is also the director of Infant Toddler Clinical Operations at the Marcus Autism Center. "Our goal was to make the Talk With Me Baby resources adaptable to each state’s currently existing models for Language Nutrition. We are especially excited to see how the toolkit can be used in the newly adopting states." The toolkit is available on the TWMB Website www.talkwithmebaby.org and includes resources such as developmental milestones, downloadable posters, conversation starters and partnership opportunities. Narrative conversation with babies at the earliest ages stimulates brain development and builds language, literacy and social emotional skills. Children who do not read on grade level by the third grade are four to six times more likely to eventually drop out of school. The goal of the Talk with Me Baby program is to ensure that all children read on grade level by the end of third grade by increasing their vocabulary and conversation beginning in the womb. Eighty-five percent of all neurons are developed by age three. By simply including babies in every-day conversations and talking to them about everything, their chances of academic success drastically improve. "There is a huge increase in the capacity of the brain that occurs in the last part of pregnancy right before babies are born," explains Brenda Fitzgerald, MD, commissioner of the Georgia Department of Public Health. "Babies are hard wired to learn different languages at the earliest age and how they learn first is from the caretakers. We have to leverage the simple practice across the board of talking to babies and toddlers in order to nourish their brains and set them up for better performance in school and life."